Welcome to the newest issue of the Homeschool Seeker! I’d like to extend a welcome to all new subscribers. What a month! My original idea was to discuss “end of year duldroms and issues” in this newsletter. Indeed that is how the month started for me. I was feeling stressed about my children’s progress and I really wanted school to be over for the year. Then something happened that changed everything. Southern Illinois and Missouri were hit by an inland hurricane. We were without power for a week and this gave us a lot of time to adjust our perspective. A week later I left on a trip up north for a family event. When calculating the school year end I had forgotten to figure in the days my daughter and I would be gone. I also find that taking long trips also has a way of bringing things into perspective. I suppose that is what I needed to lift me out of those duldrums . This issue will therefore not dwell on a difficult end of a school year but instead will focus on something more proactive…Emergency Preparedness. > I hope you enjoy this month's newsletter. This month's feature mini lapbook is on Emergency Preparedness. After our recent local disaster, I realized how important it was that we had been prepared for just such an emergency. Of course, we didn’t suffer much damage compared to others but being prepared certainly helped us with our situation. Our children took the whole event in a stride and managed the stress well. Two things that helped were that we had an emergency box and all three of my children are scouts-therefore we had on hand many handy things they regularly use while camping or in scouts. This mini lapbook will give you a chance to discuss emergency situations and help your children think about what they might need in a disaster or do when a big disaster hits or even perhaps just when the power goes out during a storm. a title. I will use EMERGENCY! In reality, it is not really necessary to label every page. If you don’t want to label every page-don’t. This lapbook can be geared to any age level. For younger children have them cut out pictures from magazines while older children can actually make an emergency kit and draw items needed and discuss key items to include and why. Actually collect items for an emergency kit. Please make a kit. At least make a first aid type of kit including band aids, antiseptic, bandages, scissors, tape and hydrogen peroxide and alcohol pads. In relation to emergency preparedness, you might remember having fire drills if you went to a public or private school. This is also something you should discuss with your children...if the house is on fire, where do they go, what should they do or not do (don't hide). Review what to do with your children in case of an earthquake, tornado, hurricane (didn't think it would happen in the Midwest but it did), fire, blizzard (not the DQ kind) etc. Giving your children this type of information prepares them and gives them a positive way to handle scary situations. Emergency Preparedness Tip of the Month: Talk about what to do in case of a tornado, hurricane, wind storm, fire, earthquake with your children. Sometimes we just forget they haven’t experienced these things and tend to assume they will know what to do. The reality is that every house/family/home situation is different and there will be things that just your family needs to address. An example would be the location of the electrical box or what to do with the water heaters or where the safest spot to go in your home during a tornado. 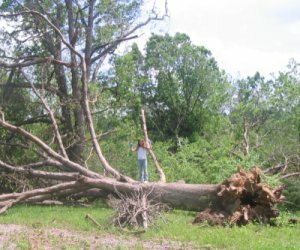 When the inland hurricane hit, I wasn’t home but my two youngest children were. Even though they were home alone and we couldn’t reach them, I was able to not stress to much because I knew our house was protected by design and that my children knew what not to do as well as what to do. Just the same, I was tremendously relieved when I finally was able to hear my daughter’s voice on the cell phone. The damage didn’t matter as much as having my children safe. This was another amazing event that happened on our farm this May. Our guinea hens hatched 12 babies! I love that my children have the opportunity to witness on a regular basis the beauty of new life and the natural cycle of things. Question: My children are young, how much should I discuss emergency preparedness with them? Answer: You certainly don’t want to scare them so much that whenever a storm approaches they get freaked out but even a small child can feel empowered if given a small task to be responsible for and to help out. Examples might be to have them find the candles or flashlights or in the winter to gather the blankets. Ultimately, you know your child and how much they can understand so discuss the possibilities but focus strongly on the proactive measures they need to take to keep themselves safe. NOTE: If you are receiving the Text versions some of the links seem to be getting chopped off.